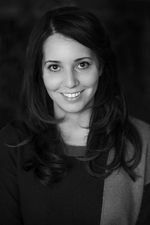 Jeannie Vanasco is the author of The Glass Eye (Tin House Books), a Summer/Fall 2017 Indies Introduce adult debut and an October Indie Next List pick. “Jeannie Vanasco promised her father before his death that she would write a book for him, never knowing the psychological and mental toll the process would ultimately take on her,” said Jamie Thomas of Chicago’s Women & Children First, who served on the Indies Introduce panel that selected Vanasco’s debut. “Vanasco explores her family’s history: the entirely separate family her father had before she was born; the late-in-life marriage that led to Jeannie’s birth; and her own destructive behavior as she falls in and out of mental illness, which informs the truly fascinating structure of the book. The layers found in this memoir are as plentiful as the layers found in the human eye; ultimately, it is as deeply layered as the human experience itself,” said Thomas. An Ohio native, Vanasco has published work in the Believer, the Times Literary Supplement, Tin House, and elsewhere. She currently lives in Baltimore and teaches English at Towson University. Thomas recently spoke with the author about how her grief and mental illness affected the writing of her debut. Jamie Thomas: The Glass Eye is a multifaceted memoir about your childhood and your relationship with your parents, but it also focuses on the emergence of your mental illness and grief after your father’s death. Can you talk about your writing process? Jeannie Vanasco: That’s a really great first question, because The Glass Eye, ultimately, is about confronting grief through writing. For a year or so, after I began the book as memoir, I didn’t trust the writing process. I made narrative outlines, which left no room for exploration. Those outlines went into binders labeled by character. Each binder divided scenes into tabbed sections, organized by theme or symbol. But those methods shifted, based on whatever Moment of Clarity I had supposedly reached. For example, at one point I thought: Staircases are the solution! The binding principle! So, I drew staircases and cut out — with scissors — scenes with staircases. Then I pasted the sentences about staircases into shapes of staircases, and rearranged the narrative arc according to staircases. If no literal staircase appeared in a scene, then clearly some metaphorical staircase existed, which was really a metaphor for finding Meaning, or some nonsense like that. Finding image patterns can be useful, but I was nearing a full-blown manic episode. The more I organized my writing, the more disorganized my thoughts became. I remember spending my grocery money on the Martha Stewart office supply line. I asked myself: Do I buy tofu or binder tabs? I chose binder tabs. I wasn’t hungry, or even tired; I craved order and meaning. And I needed my signs and symbols color-coded. But here’s the useful, sane part of my process: my process journal. There, I reflected on my writing experience. I never planned to weave those entries — where I’m basically talking to myself — into The Glass Eye. Those passages get pretty overt and heavy about technique, yet they also reveal the book’s emotional core, the through-line: my attempts at writing a book for my dad. My editor, Masie Cochran, reassured me that The Glass Eye could be about that struggle. Without Masie, I’d still be collaging staircase sentences. Or maybe I’d have moved on to windows, ceilings, and doors. JT: Your debut is nostalgic for your childhood, but also very present. Some of the most compelling sections reference the writing of the book as you’re writing it, so readers are in the moment with you. How did you balance the past and the present? JV: I wanted the writing sections to deliver the emotional punch of classical narrative all while reminding the reader that they’re words on a page. I’m not interested in constructing an arc the way one traditionally constructs plot in narrative writing. Life almost never happens that way, unless the experience is human-made. I wanted a different type of order, not a narrative of my experiences but a narrative of myself, the ways I perceived and processed my experiences. As a reader, I don’t care a whole lot about a memoir’s premise. I’m interested in how a memoirist finds a form to tell the story. The conventions that we break — in writing and in life — reveal the texture of our feelings and thoughts. But I can theorize about the technical and moral dimensions of hindsight perspective all day. In practice, balancing the past and present is tough. I think that’s because the balance is intuitive, which — as I rewind this sentence — sounds counter-intuitive. So let me try again: I couldn’t find the balance because I’d been working on the book for so long. I’d ask myself: When does my narrative present become my past? After three months? After three years? I remember explaining the problem to a doctor in the psych ward: “I can’t figure out my narrative present.” Say it in a writing class, and yeah, it makes perfect sense. Say it in the psych ward, and you’ve just added an involuntary week to your stay. I didn’t find the balance between past and present until Masie became my editor. After she recommended integrating my process journal, the book came together. She and I went back to an earlier draft, which was mostly chronological, and she helped me build the real arc by lifting my journal passages. It’s weird: exploiting the artifice of writing was the most honest thing I could do in my writing. JT: You don’t shy away from bringing the reader along with you for some of the more confusing and scary moments you’ve lived through, from manic episodes to sexual assault to the grieving process. How did you work through writing about such difficult subjects? JV: I felt lonely for a long time after my dad’s death. I didn’t know how to talk about my grief. I definitely didn’t know how to talk about my hallucinations. And I figured I should be over the sexual assault stuff. My silence motivated my writing. Throughout most of my 20s, however, I had an extraordinarily hard time writing. Manic, I couldn’t organize my thoughts. I’d get hypergraphia so bad I’d write on my arms and legs when I ran out of paper. Depressed, I couldn’t write at all. Locked in a mixed-state, I wanted to scratch off my skin I felt so anxious inside my body. Untreated, I had maybe one productive month a year. My therapist and psychiatrists deserve a lot of credit. Thanks to them, I gained enough distance to process and write about my most painful memories. JT: So much of the book is about how humans try to place meaning on what could be merely coincidental — meeting a woman named Genie while you’re trying to find out more information about your half-sister Jeanne, or changing the letters around in words to give them a stronger significance. Has your concept of fate and coincidence changed over the course of writing this book? JV: Definitely. I now understand: if you see signs everywhere, you see them nowhere. I’d be lying, though, if I didn’t say I miss finding connections in the most mundane things: cat toys, restaurant menus, furniture assembly directions. But manic and mixed episodes slowed me down artistically. I’d end up in the hospital for weeks, then get stuck doing full-time outpatient, then end up on meds that blunted my thinking for a good three or four months. I can’t write like that. On the right meds, I’ve found a balance. I can still make connections; however, they’re not debilitating. JT: Do you feel like The Glass Eye has finally given you closure for your father’s death? Do you think you’ll ever write a book for your mother, as you vow at one point in the memoir? What are you working on now? JV: I’m still sad about my dad’s death, but I’m more comfortable with the sadness. Last month, I visited his grave, and I felt okay. I cried, sure, but I didn’t feel like my life was ending. I think that’s because I kept my word; I wrote a book that shows how much I love him. I’d like to write a book for my mom. Right now, I’m playing with a few different projects. One of them is inspired by my friendship with someone I met in the hospital. I’m interested in how mental illness impacts friendships, though that’s only the triggering subject. What the true subject is, I don’t know yet. But that’s what I love about the writing process. The not-knowing. 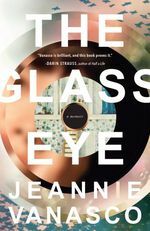 The Glass Eye by Jeannie Vanasco (Tin House Books, Trade Paperback, Nonfiction, $15.95, 9781941040775) On Sale Date: October 3, 2017. Learn more about the author at jeannievanasco.com.